← Return to Audubon Springs on Tour! It’s a Party in the Pavilion! Hello! 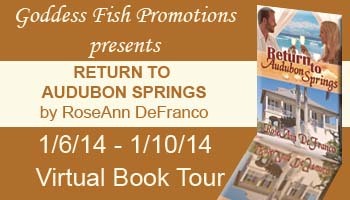 Return to Audubon Springs continues its tour today on Long and Short Reviews. I was asked to share my feelings on Critique Groups. Remember I’m giving away a $25 Amazon Gift Card to one lucky entry in the Rafflecopter Giveaway throughout the tour. Stop by and leave comments and tweets every day in order to enter to win! Click the link and enter to win. This entry was posted in Giveaway, Guest Blog, Return to Audubon Springs and tagged Long and Short Reviews, Return to Audubon Springs, RoseAnn DeFranco, Violet Femmes, writing. Bookmark the permalink.